Enchanted Circle Theater (ECT) invites you to explore an innovative creative education tool based on the life of one of America’s most inspiring champions for freedom. 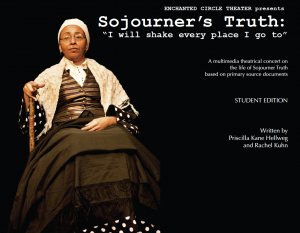 Sojourner’s Truth: “I will shake every place I go to,” written by Enchanted Circle Theater’s Executive Artistic Director, Priscilla Kane Hellweg and Associate Director, Rachel Kuhn is a multimedia creative teaching tool, based on primary source documents. Sojourner’s Truth directly addresses standards-based themes within the Massachusetts Curriculum Frameworks, including: Slavery, Abolitionism, Equality, the Right to Vote, Civil War and related themes of economy, and nationalism, and important political and cultural figures of the time. This multimedia teaching tool transports readers to the Civil War era with primary source documents, historical photographs, traditional Spirituals, and soulful original music captured on a CD of the theatrical concert. The theatrical script, spiral bound in color including primary source documents, historical and performance photographs, authors’ note, bibliography, musicology of the performance, and nonfiction text features (Table of Contents, Glossary, and Index). An audio compact disc of the full theatrical concert, including traditional and original musical compositions. An additional compact disc of supplemental materials, including: a Massachusetts Curriculum Frameworks and Common Core alignment key, a study guide of arts integrated activities addressing curriculum frameworks, and a PowerPoint presentation of historical photographs with captions. Full theatrical script, spiral bound in black and white. The full theatrical script spiral bound in color including primary source documents, historical and performance photographs, author’s note, bibliography, musicology of the performance, and nonfiction text features (Table of Contents, Glossary, and Index). An audio compact disc of the theatrical concert including traditional Spirituals and original musical compositions. Enjoy a sneak peek from the audio CD! email monisola@enchantedcircletheater.com, call us at (413) 534-3789 or download the order form here.